The surviving members of The Doors – guitarist Robbie Krieger and drummer John Densmore – marked the 50th anniversary of the release of their self-titled debut album at a special event in Los Angeles on Wednesday, and video from the celebration has surfaced online. 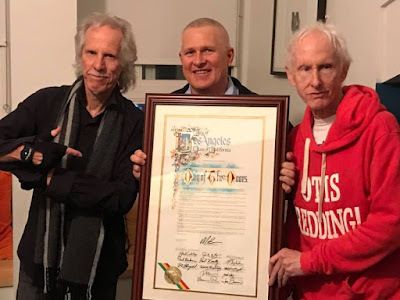 Joining Densmore and Krieger were family members of the late Ray Manzarek and Jim Morrison as the city honored the group by proclaiming January 4 as the “Day Of The Doors” with a proclamation from Los Angeles City Councilmember Mike Bonin during a public event at the intersection of Pacific and Windward Avenues, the location of the iconic “Venice” sign. "Well, it's 50 years of The Doors,” said Krieger. “We started right here in Venice and we're ending up right here in Venice too so it's all a cycle, you know?" Frontman Morrison died under suspicious circumstances in Paris, France in 1971 at the age of 27, and keyboardist Manzarek died from bile duct cancer in Rosenheim, Germany in 2013 at 74. Remembering their fallen bandmates, Krieger explained, "You know you cannot say what Jim would have done or said because he always would do something different, but I bet you he would've been here and he would've dug it and I think he would've been proud." Following the ceremony – which included a ceremonial lighting of the Venice sign and the band’s logo – Krieger and Densmore ran through a version of the band's classic, “L.A. Woman”, as the crowd cheerfully sang along. In sync with the event, The Doors announced plans to release an expanded, 50th Anniversary Deluxe Edition of their self-titled 1967 debut album on March 31.